Stacey and Arthur are still missing - and poor old Martin is at his wits end! When Tam and Nancy find them on the roof of The Vic, Tam runs to find Martin. Nancy tries to talk to Stacey, but quickly realises all is not well at all. Martin manages to calm Stacey, but when she tells him that Arthur's real father is in fact... God, he's slightly taken aback! 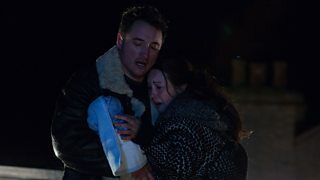 Somehow he covers his shock and manages to convince Stacey that he's on her side, he takes Arthur safely in his arms. When Stacey nearly slips from the roof, he manages to grab her in the nick of time. 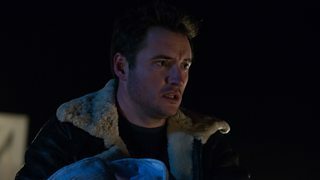 Walford's newest hero - Martin Fowler! Will he be able to get Stacey the help she needs, before someone gets hurt? 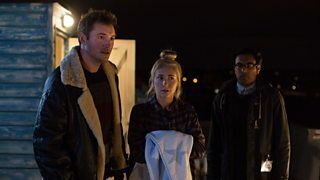 This episode will be on screen on Monday 11th January.